Welcome to the St James’ Anglican School TechBar. The TechBar aims to provide you with information regarding technology at our School, particularly iPads. 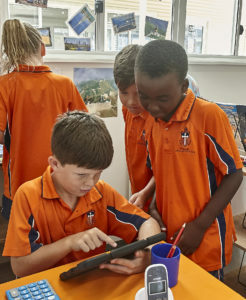 In 2016, in its second year of operation, St James’ introduced a 1-1 iPad program for Years 3 – 7. This program required parents to supply an iPad to be used at school for educational purposes. The program continues in 2018. As the School grows, all students from Years 3 – 9 will be expected to have an iPad. For students in Year 10 onwards, the iPad is also the recommended technology, but in acknowledgment of the status of Year 10, 11 and 12 as senior academic years, students are permitted to use a Macbook laptop in place of an iPad. Please note that the use of a laptop does NOT extend to students in year groups earlier than Year 10. Specification on the appropriate iPad and Macbook are available in the link below. Students from Kindergarten to Year 2 use iPads purchased by the School. These iPads are stored in charging units and used during small group situations. There are approximately eight per class. The School Curriculum and Standards Authority is responsible for curriculum, assessment, standards and reporting in Western Australian schools. It stipulates ICT skills (Information and Communication Technology) as one of the seven General Capabilities that need to be taught as part of the curriculum. The other General Capabilities include Literacy, Numeracy, Critical and Creative Thinking, Personal and Social Responsibility, Ethical Understanding and Intercultural Understanding. These are skills students need to fully participate in the 21st Century. is concerned with designing and creating technology solutions and involves developing computational thinking and coding skills. Design Technology revolves around engineering principles, food production and materials. The world is rapidly changing and this is largely being driven by technology. It is essential we equip our students with relevant skills which can be applied across a wide range of fields and occupations. Please see the links below for more specific information regarding iPads at St James’. Alternatively, email it@stjames.wa.edu.au if you have any questions. At St James’ we embrace technology and innovation. We thank you for your support as we establish our technology program.